Solidify Jockey under Emma-Jayne Wilson, captures the $125,000 (Grade III) Grey Stakes for owner Paul Braverman and Timothy Pinch and trainer Reade Baker. Two-year-old colt Solidify was the stakes star of Woodbine's second annual Grey Day on Sunday, as he circled the Grey Stakes field to win the featured $125,000 Grade 3 event contested over 1-1/16 miles on the main track. The Tapizar-Elaborate colt is now undefeated in two starts for trainer Reade Baker and Boston-based owners Paul Braverman and Timothy Pinch. Bred in Kentucky by China Horse Club International, Solidify is a full-brother to Peppered, who was the runner-up in last year's Grey Stakes. Grimgrinnin' Ghost, the longest shot on the board at 42-1, edged out the other Baker trainee, Inclusive, for fourth, resulting in a $2,448.60 payout for a $1 ticket. 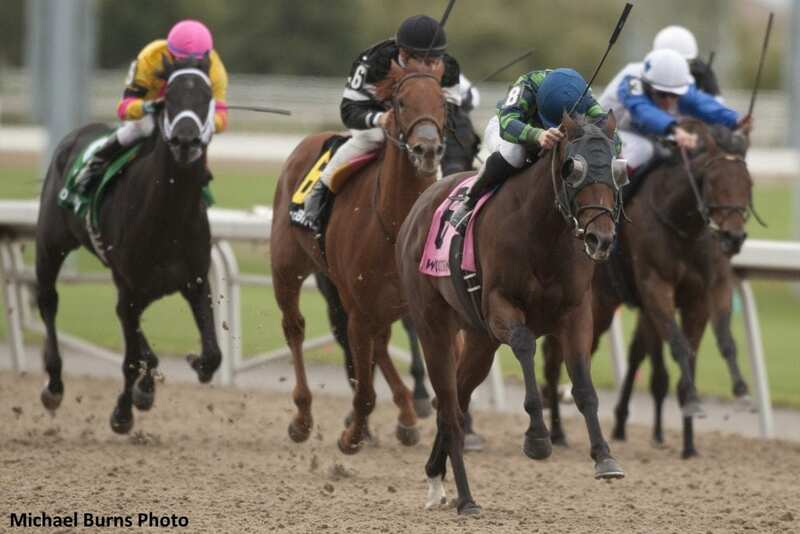 This entry was posted in Racing and tagged china horse club, Emma-Jayne Wilson, Grey Stakes, Reade Baker, solidfy, tapizar, woodbine by Woodbine Communications Office. Bookmark the permalink.